Restorative dentistry is often required when a tooth is weak or broken – either through decay, excessive wear, injury or following a root canal treatment. One of the most effective treatment options is a dental crown. Custom-made in a dental lab to your exact specifications, a crown has the combined benefit of restoring the tooth to full function while creating an excellent aesthetic result – so it’s a treatment that’s as suited to the front ‘smiling’ teeth as to the practical chewing teeth. 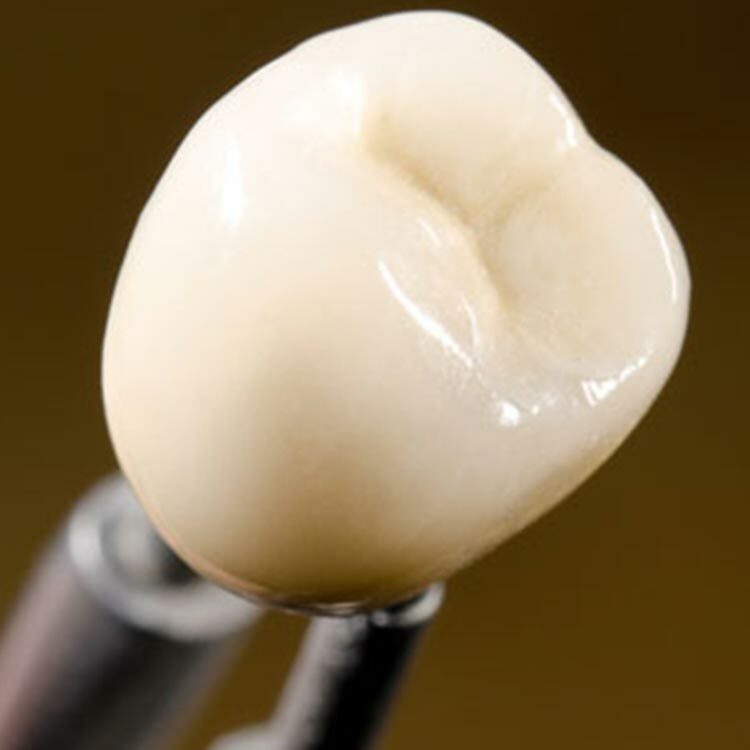 A crown is a tooth-coloured prosthetic that is placed (‘crowned’) over the top of your existing tooth. It is custom-made in a dental lab using your dental impressions, so as well as restoring your tooth’s function, a crown can be tailor-made to look exactly how you want it in terms of shape and shade. Getting a crown will require the dentist to prepare your tooth by filing it gently down into a smooth shape that will successfully accommodate the restoration. Your dental impressions will then be taken and sent off to a lab, where your crown will be made according to your specifications. When it’s ready, you’ll return to the dentist to have it permanently bonded in place. You’ll be given a temporary crown while you’re waiting for your custom restoration to be made. Does it hurt to get a crown? No. The procedure is carried out under a local anaesthetic, and you shouldn’t feel any discomfort. Materials can vary according to your needs – front teeth are often restored with ceramic crowns, which offer fantastic aesthetic results. Slightly stronger porcelain is often used for the rear, chewing teeth. A crown that has been well placed and which is well looked-after can last up to 20 years – though this is dependent on maintaining excellent standards of oral hygiene. If you are missing a single tooth or a number of adjacent teeth, a bridge is often an excellent aesthetic restorative dentistry solution. Traditional bridges consist of a prosthetic tooth or teeth, held in place at each end by a crown. Full arch bridges can also be secured in place by dental implants. What are dental bridges made from? Typically they’re made from porcelain, which is fused either to a metal or ceramic ‘base’. What’s the difference between traditional and implant retained bridges? Traditional bridges are held in place by a crown at each end. Implant-retained bridges are an excellent alternative to dentures, using a minimal number of dental implants to securely hold a dental bridge in place, permanently. A traditional bridge will involve the same procedure you’d expect with a dental crown, whereas an implant-retained bridge will involve implant surgery followed by placement of the bridge. How is my dental bridge made? Dental bridges are made in a dental lab to your exact specifications. 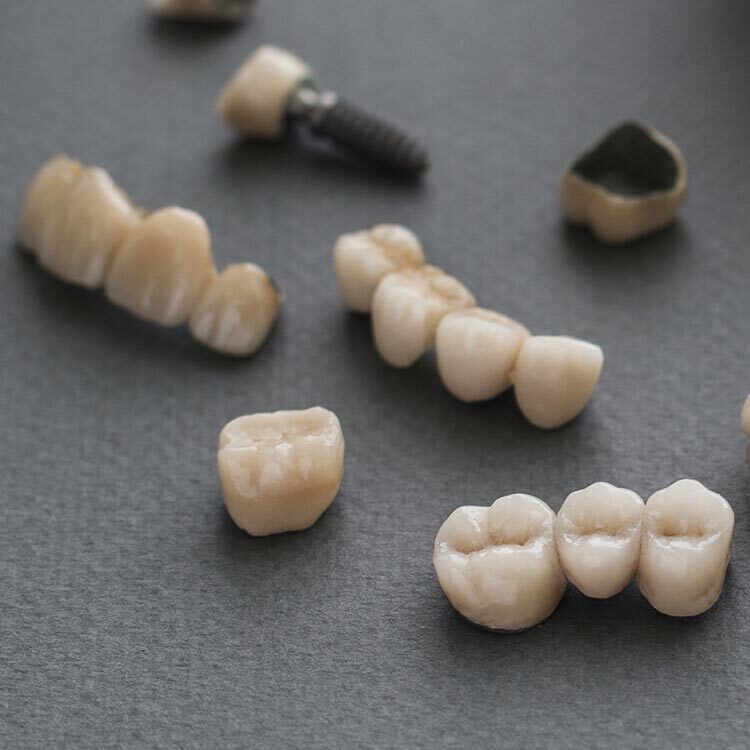 For traditional bridges, we’ll take your dental impressions when your teeth have been prepared to receive the crowns, and these will be used by the lab to model and fabricate your prosthesis. For implant-retained bridges, we can use our CBCT scanner to create a 3D model of your jaw, which can also be used by the lab to create your ideal new smile. Will I get a temporary bridge while I’m waiting for my permanent fitting? Yes – we’ll talk you through the options beforehand and fit you with a practical temporary bridge that is suited to the period of time you’ll be required to wear it. Does it hurt to get a bridge? No – local anaesthetic is used throughout the procedure so you won’t feel any discomfort. How long will a traditional bridge last? With good oral hygiene, a well-placed dental bridge can last up to 15 years. How long will an implant-retained bridge last? Dental implants are permanent, so with good oral hygiene an implant-retained bridge has the potential to last a lifetime. Restorative dentistry also encompasses veneers – eggshell-thin layers of porcelain that are bonded over your existing teeth, effectively concealing a multitude of dental problems. Because veneers can be shaped and shaded exactly how you want them, they are often considered the treatment of choice for complete smile makeovers. If you’ve come to Carbasse Implant & Dental Centre for dental implants, but want to perfect your existing teeth too, we can include veneers as part of your treatment plan. Once you and your dentist have designed your smile, your veneers will be made in a dental lab, using your dental impressions. Each veneer is a completely bespoke creation, and will be the exact shape and shade you want it to be. Veneers are essentially a way of covering up dental imperfections and are a one-treatment solution for a host of dental issues – including gappy, crooked, misshapen, cracked or discoloured teeth. To place veneers, your dentist will need to prepare your teeth by gently filing away a layer of enamel proportionate to the depth of the veneer. This can be done under a local anaesthetic if necessary. Your veneers are ready, the dentist will secure them in place using bonding adhesive and cure them under a special light. Usually two visits are required – one during which your teeth are prepared and dental impressions taken, and one to place the veneers. In-between, if required, we can provide you with temporary veneers. No. While veneers hide a multitude of dental problems, they are mainly limited to concealing cosmetic imperfections. 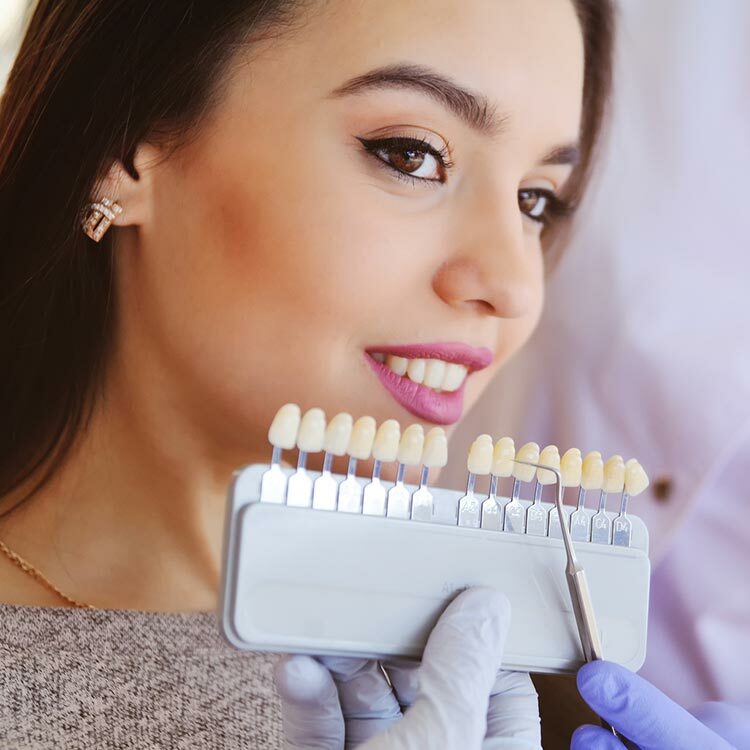 If your dentist identifies more serious problems, such as issues with your bite, overcrowding or teeth grinding, it may be that these have to be rectified before you can consider veneers. Anything up to 20 years with the right care and attention to your oral hygiene. Veneers are easy to repair if they become chipped or cracked. Veneers are not as porous as your natural teeth, so they shouldn’t stain if they are properly looked after. And if your veneers have been properly fitted and bonded, you shouldn’t develop the dark line around the gum line that is often a tell-tale sign of veneer treatment.